AP EAMCET 2017 BiPC Stream Admissions Seat allotment list, Web Counseling dates, Certificate Verification Schedule, Web Options Dates. 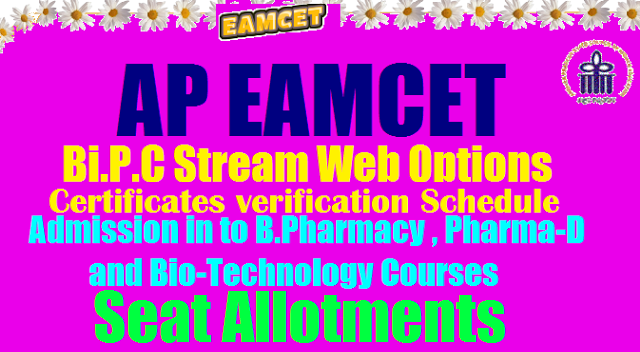 Certificates Verification and Option Exercise for Web based counselling:: AP EAMCET 2017 BiPC Stream Web Counselling, Web Options,Certificates verification Schedule released @ apeamcetb.nic.in: First Phase AP EAMCET 2017 BiPC Stream Admissions, Web Counseling dates, Certificate Verification Schedule, Web Options Dates. Certificates Verification and Option Exercise for Web based counselling. APEAMCET 2017 BiPc Stream Web Counselling Rank Wise. AP EAMCET 2017 Bipc Counselling Dates Rank Wise, Certificates Verification, web options, seat allotment details at Official Website www.apeamcetb.nic.in. The qualified candidates of A.P-EAMCET-2017 (Bi.P.C Stream) are informed to attend certificate verification in any one the Help Line Centers (HLCs) mentioned in the Annexure-I and as per the schedule given under to take admission in to B.Pharmacy , Pharma-D and Bio-Technology Courses. The details of the ranks distributed Help Line Centre wise for Certificate Verification and all other important information are placed on the Website: https://apeamcetb.nic.in and candidates are informed to visit this website before they go for Certificate Verification. Eligible Candidates of AP EAMCET-2017 (Bi.P.C. Stream) rank from 1 to last are informed to exercise the options on 12.09.2017 and 13.09.2017 using their old password and Login ID.No. for the leftover seats now available and consequential vacancies that may arise in process of allotment, additional seats and seats available in new colleges/courses, if any from any Internet facility (Café/Home) as per the schedule given below. The Candidates Who have not attended for Certificate verification during earlier phases should get their certificates verified on 12.09.2017 from 09.00 AM to 05.00 PM at the following Help Line Centers. Candidates who got their certificates verified can exercise options from Rank 1 to LAST. • Who have reported/Not reported but cancelled their allotment. 1. Options given in the earlier Phases will not be considered for this Phase of admissions for allotment of a seat and candidates have to exercise options afresh. 3. Candidates who are satisfied with their previous allotment need not exercise option once again. They shall note that if they exercise options now and a seat is allotted as per the options, the vacated seat will be allotted to next meritorious candidate and hence they will have no claim on the previous allotment. Processing Fee to be Paid: Processing Fee: Rs.1200/- (OC/BC), Rs.600/-(SC/ST). 1. Processing fee can be paid online by the candidate using credit card or debit card or through net banking from 11.09.2017. 2. Visit https://apeamcetb.nic.in and click on processing fee payment online. processing fee should be paid online by the candidate before he/she attends certificate verification. 8. In the event of transaction failure amount will be credited back into your account after two working days. Pradesh are only eligible to be considered under “CAP” Category. Verification of Certificates of the Candidates for OC/BC/SC/Minority categories will be done in all the Help Line Centres. However, Certificate Verification of ST Category candidates will be done in the Help Line Centres indicated with ** in Annexure-II. the ranks are distributed Help Line Centre-wise and placed on website:https://apeamcetb.nic.in and hence they are informed to attend for certificate verification in the HLC where their ranks are mentioned. 1. Candidates are informed that where there is more than one Help Line Centre the ranks are distributed Help Line Centre wise, See the Annexure-I for Distribution of Ranks Help Line Centre wise and attend for Certificate Verification accordingly. ST candidates shall attend for Certificate Verification in the Help Line Centres marked with ** only, as per Annexure-II. The List of Help Line Centers, Distribution of ranks HLCs wise i.e., Annexure –I &II will be placed on website. 1. Processing fee can be paid by the candidate using credit card or debit card or through net banking from 07.08.2017. Tuition Fee particulars and seats available under Convenor Quota College-wise will be made available on the website https://apeamcetb.nic.in well before the commencement of Option Entry. The fee reimbursement for eligible candidates is subject to the guidelines issued by the Government of AP from time to time.